Two weeks ago, while I was in Boston, I was at my laptop when suddenly the backlight turned off, my CD drive tried to eject a non-existent disk and it locked up. I rebooted it, and everything was normal, except that my trackpad no longer worked. In fact, my Mac couldn't even see that I had a trackpad. This is not a big deal, as I do have a few external mice, but it is annoying. A week ago, I decided to see if disconnecting and reconnecting the trackpad cable might fix the problem. So I popped the bottom off my PowerBook, and I saw Figure 1 below. Note that the plastic tape on the trackpad cable has a gaping, melted hole in it. Flipping that tape back reveals Figure 2, below. Note that there is are two capacitors, and a pile of black ash where the third one should be. 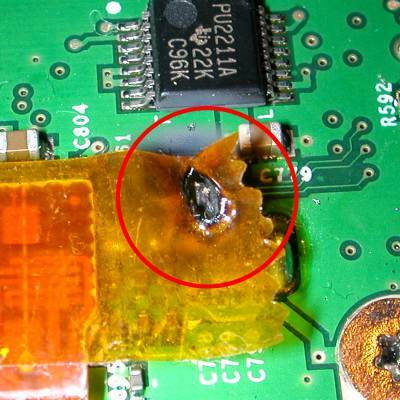 The burnt capacitor itself has actually become disconnected from the circuit board, since the heat melted the solder. Frankly, after seeing the damage, I am amazed that my PowerBook continues to work at all! In a strange coincidence, shortly after this happened I read a second hand comment from an Apple hardware engineering that apparently they put it extra capacitors to try and avoid this kind of failure. I guess that the capacitor that went on my computer was a critical one. Unfortunately, travelling without a trackpad is very inconvenient, so I may be forced to replace this thing soon. One of those new MacBook Pros might be pretty sweet.